In terms of market share, the latest figures from Kantar show Tesco taking 27.6% of the market, while Sainsbury’s (15.9%) and Asda (15.5%) come in second and third place with Morrisons (10.5%) in fourth place. Since the start of 2015, the Big 4 have conceded -4.6% to the other grocery market players with Aldi (+2.5%), Lidl (+1.9%) and Ocado (+0.4%) the beneficiaries. The combined Sainsbury’s ASDA business would have a total market share of 31.4%, bringing them in above Tesco, creating the largest supermarket chain in GB. The CMA will be left in two minds; to reject and keep the so called “Tescopoly” that exists today or accept and have a duopoly with both controlling nearly 60% of the market, with the third biggest chain (Morrisons) way behind with 10.5%. Using LDC's store location data for these brands and plotting this information onto a map, a concentration in the South of England is evident (Map of all Sainsbury’s, ASDA and Argos stores). Over 82% of Asda stores in Greater London are within a 2km radius of a Sainsbury’s store, with this revealing a potential threat of cannibalisation occurring in the capital. According to Estates Gazette Asda own more of their stores with 90% on freehold compared to c. 65% for Sainsbury’s (Source: EG). This may make disposals harder for Asda, but with the level of overlap the CMA is likely to require some concession in terms of closures of stores. Overall, the combined group would have 49.3% of the total Big 4 stores across GB. The regions with the largest overlap in store portfolio are all in the South of England, with this the likely area the CMA will investigate for potential store closures. Nearly half of all Asda stores in Greater London, the South West and the Midlands have a Sainsbury’s supermarket within a 2km radius which makes these regions likely to see some closures, even though the London stores have some of the largest contributions to profitability. For landlords, the prospect of these closures is a cloud on the horizon as there is a distinct lack of ready replacements willing to take up a 45,000 sq. ft. out-of-town ex-supermarket unit (the average square foot for Asda supercentres is 100,000 sq. ft.). Morrisons are the most likely occupiers, with this deal providing a chance to acquire some suitable properties on the cheap with experienced staff to run the stores. Morrisons, who recently extended their partnership with Amazon across London and Hertfordshire selling thousands of fresh, frozen and chilled food products, will however push for this merger to be scrutinised due to the position it will leave Morrisons in in terms of market share. Waitrose and The Co-operative Food will be affected to a lesser extent due to their niche clientele for the former and the focus on convenience for the latter. A key focus from Sainsbury’s is the need to create retailing for the future with the acquisition of Argos and subsequent opening of concessions in Sainsbury’s supermarkets across the country continuing to gain momentum. Analysis shows that this strategy would work well for Asda stores, with over 230 Asdas in locations with no Argos within a 2km radius. Sainsbury’s would also be able to extend their partnerships with their existing concessions such as Crussh, Jessops and Habitat to Asda stores. Conclusion – to merge or not to merge? Over the coming weeks, the £15 billion deal currently on the table will be investigated in detail with Sainsbury’s and Asda set to argue their case to the CMA. They will point to the rise of online players such as Ocado, and the ever-present threat of Amazon who continue to grow their grocery offer stateside through their Whole Foods Market acquisition. 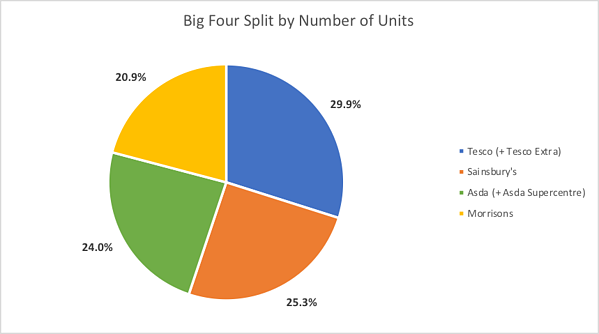 The growth of discounters such as Aldi and Lidl over the last years has also balanced the market slightly with the Big 4’s market share dropping from 76% in 2009 to 70%. Sainsbury’s will also use the CMA approval of the Tesco and Booker deal this year as precedent, due to Booker’s market share in the supply of convenience stores seen as no concern by the CMA. For consumers, whose shopping habits have changed since the 2004 merger of Wm Morrison and Safeway that created the Big 4, supermarkets will continue to be kept on their toes by the growing German discounters (Lidl and Aldi) who will continue to put pressure on prices. Suppliers, however are likely to be the stakeholders who bear most of the pain, as Sainsbury’s and Asda are pledging to cut prices by about 10%, these cost reductions are likely to be passed on to suppliers with the increased buyer power of the combined brands likely to see consolidation in the supply base. We've also released an infographic sharing the 7 key facts about the merger that you can access here.